Koh Samui City Tours – These Samui programs are called city tours but Koh Samui doesn’t really have a city, just small villages dotted around the island. 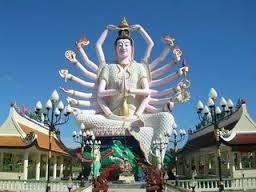 Koh Samui is small enough to circle in a day by minibus. On these tours which last about 6 hours an an English speaking guide will take you around the island in air conditioned minibus or 4×4 Jeep depending on what type of tour you book, stopping at all the best spots on Koh Samui. Yes these trips are touristy. But they are well run and very good value if you want to see a lot in a short time. They are fun for all ages and great for families. The baby elephant show is a chance to meet and feed a baby elephant and perhaps try a baby massage. The monkey show demonstrates how macaques are trained to pick coconuts from the trees. The fish spa uses Garra Rufa fish species in the traditional 400 year old therapy to pamper your feet by nibbling and sucking off the dead skin! 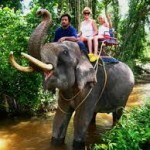 The elephant trek takes you through the jungle and coconut plantations. Tours include transfers, lunch, English speaking guide and Lunch depending on length of tour. Our favourite sightseeing tours in Koh Samui Island are Private Tours around the Island. You visit the places you like to see and your on past and stay as long as you like. 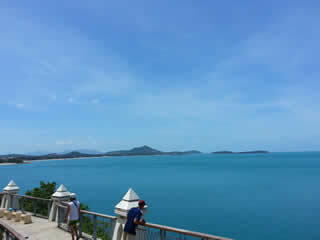 View point that you can see all Chaweng Beach. Grand Father and Grand Mother Rocks. Namuang Water Fall number 1. Tour includes: VIP Minibus will provide for the service, English Speaking Guide, First Aid Box, Full Insurance, Soft Drinks, Cold Towel, Mineral Water, Fruit in a season. Contact Us now for your Koh Samui City Tours. Use the Wishlist in our Easy 1-2 Go form and tell us what you like to do / Not to do, places you like to see. We get back to you shortly with options. If you have any questions please do ask.